The Catechism of the Catholic Church (Item 668) states, “Christ’s Ascension into Heaven signifies his participation, in his humanity, in God’s power and authority”. Referring to Mark 16:19, “So then the Lord Jesus, after he had spoken unto them, was received up into heaven, and sat down at the right hand of God”. 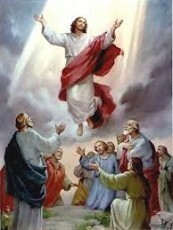 Pope John Paul II stated that Scripture positions the significance of the Ascension in two statements, “Jesus gave instructions, and then Jesus took his place”. He also seperately emphasized that Jesus had foretold of his Ascension several times in the Gospels, John 16:10 at the Last Supper, “I go to the Father, and you will see me no more”, and John 20:17 after his resurrection tells Mary Magdalene, “I have not yet ascended to the Father, go to my brethren and say to them, I am ascending to my Father and your Father, to my God and your God”. The Feast of the Ascension is on of the great feasts in the Christian Liturgical Calendar that commemorates the bodily Ascension of Jesus into Heaven. He was not “Assumed” by the Father’s power, but the “Ascension” signifies by his own. The Ascension of the Lord is traditionally celebrated on a Thursday, the fortieth day from Easter Sunday. However, some Roman Catholic Provinces have moved the observance to the following Sunday. The feast is one of the Ecumenical Feasts, ranking with the feasts of the Passion, Easter, and Pentecost. Acts 1:9-12 tells us that the Ascension took place on Mount Olivet, the “Mount of Olives”, on which the village of Bethany sits. After the Ascension the Apostles are described as returning to Jerusalem from the mount that is called Olivet, which is near Jerusalem, within a Sabbath day’s journey. Tradition has consecrated this site as the “Mount of Ascension”. The Gospel of Luke tells us that the event took place “in the vicinity of Bethany” and the Gospel of Mark specifies no location. Before the conversion of Constantine in 312, early Christians honored the Ascension of Christ in a cave on the Mount of Olives. By 384, the place of the Ascension was venerated on an open site, uphill from the cave. The Chapel of the Ascension in Jerusalem today is a Christian and Muslim Holy site, now believed to mark the place where Jesus ascended into Heaven. In the small round Church is a stone imprinted with what some claim to be the very footprints of Jesus.